Funding from state governments makes up a relatively small slice of public broadcasting’s total revenue, but it can make a big difference in what stations and networks are able to do. Strong funding for public broadcasting in Utah, for example, has enabled the Utah Education and Telehealth Network to deploy a statewide broadband network that provides valued services to schools, libraries and hospitals. In other rural states, taxpayer funds support broadcast infrastructure that extends pubcasters’ programming to listeners and viewers who might otherwise be unreachable. 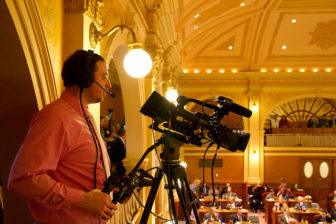 South Dakota Public Broadcasting Associate Producer Andrew Bork operates a camera at the network’s coverage of the governor’s State of the State address. Meanwhile, cuts in funding can prompt layoffs, canceled shows and reduced service — all options that networks in West Virginia, North Dakota, Alabama and elsewhere have pursued or considered in recent years. With this special coverage, Current reviews trends in state funding of public broadcasting and summarizes how money is appropriated and distributed in the 36 states where public broadcasters receive direct state support. (We’re excluding states where pubcasters receive funds indirectly through state colleges and universities.) We’ll also be tracking budget negotiations in these states and providing consistent updates as public broadcasting funds are legislated. Stations eligible for CPB Community Service Grants received $273 million in state money in fiscal year 2016, according to the most recent data available. State funding totaled 9 percent of all station revenue in FY16; federal funding through CPB’s appropriation accounted for 14.6 percent. Twenty-three states fund both television and radio; 13 provide only TV funding. 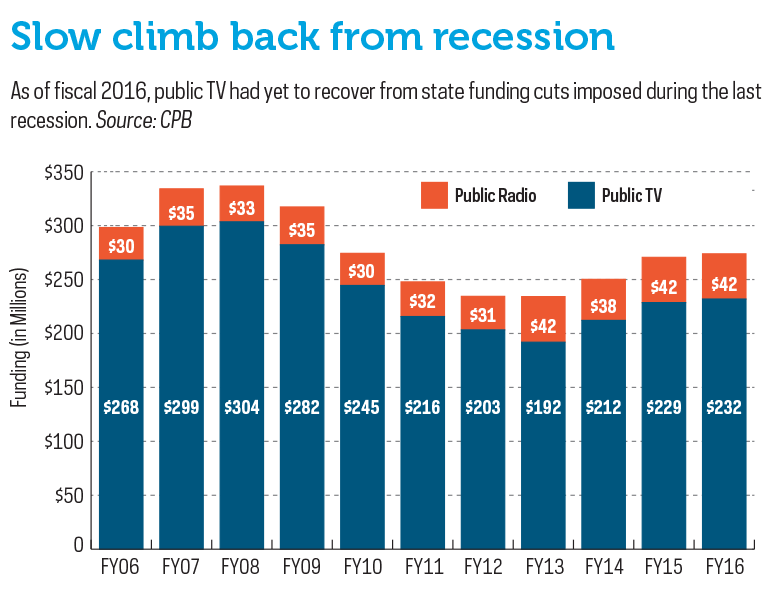 For TV stations as a whole, state funding makes up a larger share of support, at 12.9 percent in FY16; that fiscal year, state funding was 3.3 percent of public radio’s revenue. Funding trends across states have been mixed. Between the last two budget cycles in each state, 16 states saw a decline in funding. In six of those states, cuts exceeded 10 percent. Vermont PBS took the biggest hit, receiving just $1 in state support in FY2018, down from $271,103 in FY17. Funding in 10 states stayed level, and 10 more states saw increases — though Illinois’ large gains were due to a fiscal year with a stopgap budget. 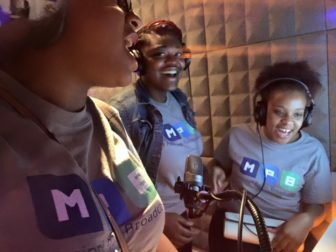 High-school students in Mississippi Public Broadcasting’s 2016 Youth Public Media Project. 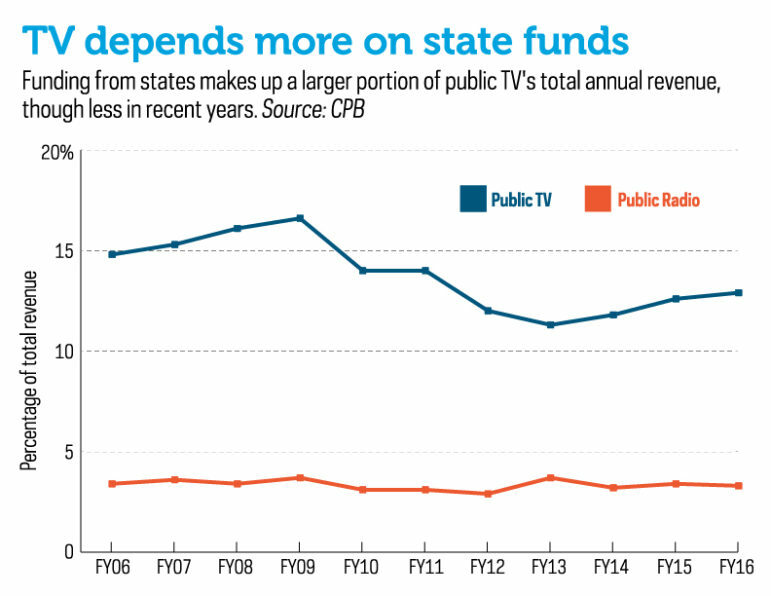 For some stations, state funds make up more than half of their revenue budgets. About 54.4 percent of UETN’s budget comes from Utah. South Dakota Public Broadcasting gets about 56 percent of its budget from annual state appropriations. And state support makes up about 57 percent of Mississippi Public Broadcasting’s budget. Mississippi lawmakers have threatened to zero out funding to MPB within six years. State support is particularly valuable in largely rural states where commercial broadcasters’ signals may not reach sparsely populated areas. “The state is largely funding the ability to distribute our signal throughout the state,” said Mark Leonard, GM at NET in Nebraska. That state covers money for transmitters and infrastructure for both public radio and television, as well as programming. Content “funded by and for Nebraskans” is vital to viewers, Leonard said. “The kinds of things that describe sense of place and pride in the state are limited.” State funding supports the longest-running locally produced TV program in the country, Backyard Farmer; Big Red Wrap-Up, a post-game analysis of Nebraska Cornhuskers Football; and the public-affairs program Speaking of Nebraska, which just completed its second season. In other states public broadcasters get very little state support. In FY2018 Oregon Public Broadcasting got about 9 cents per Oregonian. Tennessee, Nevada and Missouri also rank among the lowest states in per-capita funding. 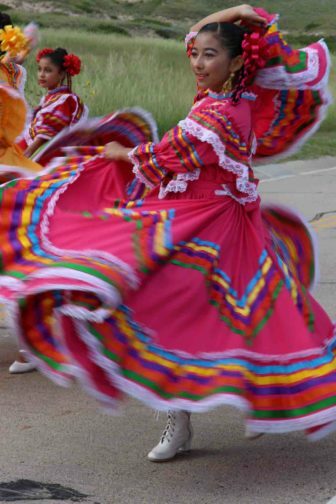 A performer of folkloric dance from Mexico in an episode of NET’s Nebraska Stories. The 14 states that provide no funding are a focus for America’s Public Television Stations. “We want to work with stations in those states to see if we can convince governments to support the work we’re doing,” said Pat Butler, president. APTS offers members a State Funding Resource toolkit to help them apply federal messaging and advocacy tools to state legislatures and agencies. Stations that focus on the “three pillars” approach — educating lawmakers on public broadcasting’s work in education, public safety and civic leadership — often can initiate, grow or save state funding, Glasscock said. As an example, Butler said Alabama Public Television “is doing wonderful work in public safety. They’re now the backbone for all emergency communications in the state.” The network also used state funds to develop popular virtual educational field trips for students, he said. Another state-funded educational success is Maryland Public Television’s Thinkport, a precursor to PBS LearningMedia that offers games and interactive activities online, Butler said. Digital Editor Mike Janssen and Managing Editor Karen Everhart contributed to the reporting for this story. FYI on the state-by-state breakdown (https://current.org/state-funding-guide/) you have an outline of Arizona as the graphic for the state of Rhode Island. Also, Rhode Island never provided funding for public radio; they only did for public television. But yes, that was phased out over three years beginning in 2012. Thanks, fixed the Rhode Island image.